Ubud is an Indonesian town situated on the island of Bali. Rice paddies and steep ravines located around the town makes this place unique and worth discovering. Ubud is known as an excellent center of art and culture and attracts millions of tourists every year from all over the world. Bearing a population of about 30,000 citizens, Ubud is surrounded by densely developed villages and you will see small farms, dense forests, and rice paddies. In other words, this lovely town and habitat of Mother Nature is well-known in Bali for its collection of beautiful villages. Enjoy your personal hobbies and pleasure such as shopping, visiting a spa, fine dining, watching art performances and visiting museums to explore the history and more. Whether you plan an adventurous trip, a relaxing family vacation, a honeymoon tour or an art excursion, you will find things to do in Ubud. When you schedule a visit to Ubud, Indonesia, temperature and precipitation become the two important factors to keep in mind. The rain is frequently a variable even when the temperature is consistent or reasonable. Weather in the city is favorable for a tour from June to September. July and August are sunny during the day and cold during evenings, so don’t forget to carry a light warm wrap for evenings if you go out. Being great from the weather point of view, July and August become the most crowded times in Ubud. Advance bookings of hotels and restaurants can become a problem so you should plan to make advance reservations before reaching the town. September is dry and cool while April and May offer nice weather with fewer crowds. A bit of traffic advice: it is best to drive into the town either in the early morning or in the evening. October is also a preferable time to tour the city if you are interested to see the Ubud Writers and Readers Festival. November and December are the most humid months. People love going to Elephant Safari Park to enjoy the rides, talent show, and elephant feeding. The adventure lover will like activities such as cycling and rafting. If you want to roam around the park, renting a scooter will be great fun and give you more mobility to access remote areas of the park. People planning a family trip should visit here because of the various activities for children. The elephant park is elegant and staff working there treat the animals with the utmost respect. You will be charged a little for entrance and more for riding an elephant. Buying food inside the park can be expensive so you may choose to bring your own food and drinks if you’re on a tight budget. You will be charged three times higher than the normal price for food. Regarding lunch and transportation, you will find the best deals online, so plan ahead. Elephants in the park are well taken care of and riders maintain a good relationship with them. An elephant ride can be enjoyable even in the rainy season and you will be offered an umbrella by the park. The staff there is cooperative enough to snap a photo with your camera during your elephant ride. You will like feeding, hugging and kissing the elephants as well as taking your pictures with them. The Campuhan Ridge Walk is one of the most well-reputed treks in the city. The beauty of the island lets you know why people from all over the world choose a trip to Bali. It offers valuable information about the historical origin of the city and, therefore, this place should be kept at the top priority during your trip to Ubud. Hand painted signs indicate the way to Karsa Kafe and encourage you to move on but don’t forget to put on sturdy shoes and carry enough water with you. The Karsa café can be a nice stop for a break for coffee or a delicious smoothie. Spending the first half of a day walking through the outskirts of the city during your trip will give you lovely views of various constructions and villas. Despite being small, this walk can be exhaustive due to the direct exposure to the sun. It is important to shield yourself from the sun by using sun-block, umbrellas and hats. Going uphill to the ridge through the temple and Ibah Hotel together offers you a beautiful walk and you will find some art galleries on the way. Passing through all the villas and hotels, you will find an amazing view of the far stretched greenery that is very relaxing to see. The head office of Bali Eco Cycling is situated next to ARMA Resort where you will find enjoyable activities for children and the best company to offer you a nice cycling experience in the city. Whether you tour the rice terraces, representing the unexpected elegance of nature, or the eye-catching mountain lake (where you can have the most memorable breakfast experiences of your life), Bali Eco Cycling is the best choice, no doubt. If you are interested to see and learn more about a coffee plantation, nothing can be a better opportunity than this bike tour. This 25km cycle ride is easy on the legs, as the entire way is downhill. Ending this exciting cycle ride with grand lunch and relaxing body massage is a good idea. All the bikes offered for this purpose are well-maintained and they also provide helmets and water bottles. Seeing the rice paddies, the Balinese homes, a coffee plantation and enjoying an excellent breakfast near the lake is an unforgettable experience. Tasting the rich Kopi Luwak coffee is also an experience worth having. A lavish, clean and well-maintained spa center, Bali Botanica Day Spa is known well for its friendly and professional staff. You don’t need anything but an advance booking for a nice massage at an affordable price. You will get good return for the money you invest here. Even more, renowned bridges on the route offer great places to stop for dinner. This is where you go to enjoy great relaxation sessions at a very affordable price. The variety of herbs, oils and lotions used during the spa session are explained by the staff. If you visit the place with your partner, book a refreshing couple massage. A four-hour relaxation for $50 is a nice treat for anyone. A wide stretch of greenery and small stream promotes peacefulness and calmness. The 2.5 hour Ayurvedic Chakra Massage is also loved by many because of the hot oil treatments included with it. The professional massage therapists here will make you feel totally calm and make you quite happy. Outside of the spa, explore the greenspace around the massage rooms located near the river. This ancient temple is very attractive, elegant, and represents the historical importance of this glorious city. Built in the 15th century, you walk for about 45 minutes from Goa Gajah (a very old carved rock wall) through rice fields to reach this temple but, it will definitely require a guide. Another option is to drive through the Banjar Batulumbang until the end of the road. A dress code is required at Yeh Pulu Temple, so be sure to dress appropriately. Despite being underrated, this extremely elegant site is highly recommended for a visit, especially for people who love to see old stone carvings. Ending a nice day here with a delicious lunch, elephant cave watching and some time at the waterfall is a good idea. Some natives can show you their outstanding wood carvings and you can even buy original art pieces from them. Being an example of the ancient Balinese Fresco, this site is of historical importance. Carrying some energy drinks and some cash (for entrance fees if applied) with you is a smart move. Art lovers will like this place for its fine and detailed stone sculptures. Despite being from the primitive age, this temple catches visitors’ attention for its outstanding artistic designs. This small but interesting place is excellent for its “must see” architecture. As the palace belongs to the royal families of Bali; the doors, carvings, statues, and architecture have been designed in luxurious ways. One of the particular things to notice here is the conventional dance performance in the palace, but you will probably feel disappointed as some of the areas of this palace have been made off-limits for ordinary people. Dance performances are catchy and attractive as dancers in their traditional wardrobe look like dolls. Shoppers will not get enough of the rows of souvenir shops along the street. If you want to see intricate architecture and grand designs, you cannot find a better place in Bali than in Puri Saren Palace. If you want to spend some time in the central and less crowded portions of the city, this place is the best escape. One of the main tourist destinations and attractions in Ubud, Indonesia is the Peliatan Royal Palace, which was designed and constructed during the 17th century. Situated along the Peliatan Village, it is one of the ancient temples that have become a center of traditions and cultures for natives. 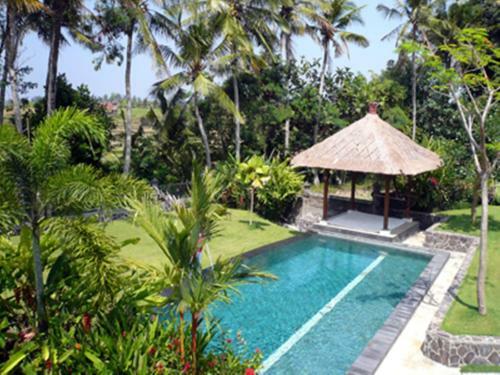 This excellent palace is open to the public and shows elegant Balinese architecture. People interested in some lovely memories of Balinese local art will love the traditional dance performance here. Kecak dance and legong dance are the two famous indigenous dance forms to be appreciated while visiting. Enjoying dance and music performance at such an affordable price (below $10) is really an awesome opportunity not to be missed when in Ubud. The beautifully maintained historical site offers you excellent chances for photo snapping and lovely talks. If you are planning to visit the ARMA Museum, you can add it on the way to Peliatan. Situated off the main road, it is simply a striking site to explore. The gate itself is so impressive and the doors are well decorated despite being small. Since it is the palace of the royal family, tourists are allowed only to inspect the site from outside. A beautiful place for animal lovers in Ubud is the Sacred Monkey Forest Sanctuary where you can not only observe these funny creatures but also learn more about their lifestyle and watch them wandering from one tree to another. It’s really impressive for those who have not ever been to a rain forests to see monkeys in their natural environment. Going to the forest is a fun adventure, but feeding the monkeys can be harmful - as they bite. Avoid teasing them and responding to them if you don’t know the correct way to treat them. As soon as you enter this natural arena, you will find these curious creatures roaming everywhere and they will search you, sometimes aggressively. Apart from them, there are elegant flowers, butterflies, and a lush garden area. It won’t be easy to relax as monkeys roam around everywhere in the sanctuary. The temple, together with the unique setting of the forest, offers a lovely view to remember. Large and magnificent trees offer shady spaces to stand under and soon you will forget all the fatigue you have after walking. Semar Kuning Artist Cooperative will make you stop and explore for sure. Located in a nice setting, this amazing site has been constructed out of 4 display units with a common reception area. As it is a cooperative group, anything sold from the art gallery supports all but photography is not allowed, and the low quality of some paintings can also disappoint you. Regarding the purchase of paintings, you may feel that certain paintings are not worth the initial price they have been tagged with but you can also get a discount on some pieces. Finding a unique piece of art at a fair price is really a challenge there. However, true native artists here offer many exclusive pieces for you to choose from. A guide can help you navigate through the gallery, letting you know more about all the paintings and telling you their prices. If you purchase one, the piece you select is taken from the frame and rolled with care to be placed in a plastic tube for hassle-free transportation. The Ubud Water Palace is a site with a huge “wow” factor through its majestic architecture, attractive front facia and a lily pond. You can arrange for a dining tour in one of the restaurants situated nearby to enjoy a fish burger or light salad while looking at the temple. Like other grand palaces in the city, many parts of this attraction are closed to the public and you can enjoy the great architecture only from the lawn and front portion. Situated near the Saraswati temple, this is an amazing place for taking photos. If you want to enjoy a dance and music performance, you should plan on visiting at night. Café Lotus is a beautiful nearby spot where the front seats are generally reserved by those who want to see the night presentation. This beautiful traditional dance performance will be saved as a special memory in your mind when you think about your trip to Indonesia. You will love to see the shortened traditional performance and interpretation of dances. These are the best collection of dances and ancient traditional stories presented in an artistic manner. Enjoyable, joyous and never boring, Tirta Sari is one adventure that you must not pass up or miss. Photographs can be taken using a 70 to 200 mm lens for stunning close-up snaps. It is an exciting area that includes several historical temples that host not only enjoyable dance performances but also offer lovely grounds to have a relaxing walk. Home to some excellent carvings and an attractive temple, Elephant Cave has few deep stone basins in shallow water. Avoid visiting there during the middle of the day or it can be a bad experience due to the hot environment. Lots of green beauty can be found all around and there is plenty of free space to walk around. This makes this place the favorite of those who want some calmness and a crowd free site.